The Food and Drug Administration has approved the use of a single pill containing two different antiviral drugs for the treatment for hepatitis C. It is the first combination pill approved for the disease, and also the first treatment that does not contain interferon or ribavirin. The new hepatitis C drug, called Harvoni, is a mixture of the antiviral drugs ledipasvir and sofosbuvir. 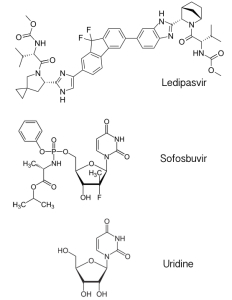 Ledipasvir (pictured) is an inhibitor of the hepatitis C virus protein NS5A, which has multiple roles in the viral replication cycle that include RNA synthesis and virus particle assembly. The mechanism of NS5A inhibition by ledipasvir is not known. Sofosbuvir is a previously licensed inhibitor that targets the viral RNA-dependent RNA polymerase. It is an analog of the nucleoside uridine, one of the four building blocks of RNA. 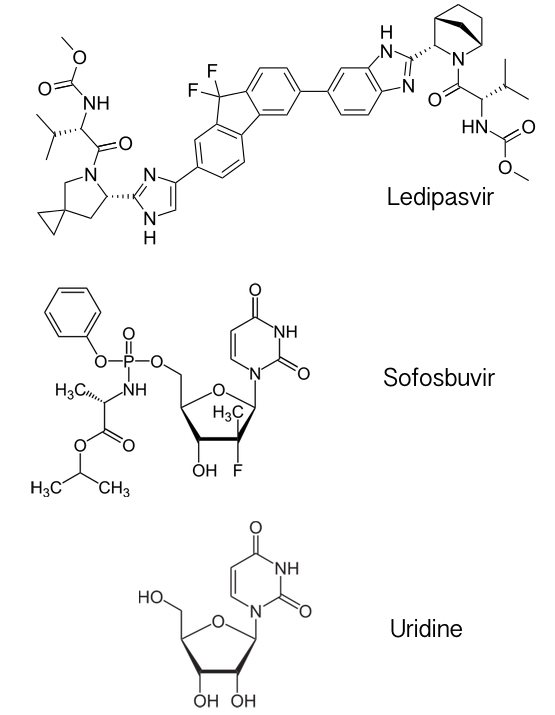 Sofosbuvir is utilized by the viral RNA polymerase, leading to inhibition of viral RNA synthesis. The use of single antiviral drugs (monotherapy) to treat RNA virus infections is always problematic because resistance usually arises rapidly. Dual-therapy pills like Harvoni are better, but the best are triple-therapy pills. Triple therapy formulations such as Atripla have been used successfully to treat infections with HIV-1, and presumably there will be mixtures of three antiviral drugs for treating hepatitis C.
Let’s use HIV-1 to illustrate the value of treating infections with multiple antiviral drugs. The HIV-1 viral genome, like that of HCV, is slightly less than 10,000 bases long. Assume that one mutation in the viral genome is needed for drug resistance. If the RNA polymerase mutation rate is 1 out of every 10,000 bases synthesized, then each base in the viral genome is substituted in a collection of 10,000 viruses. An HIV-1 infected person can make as many as 10,000,000,000 virus particles each day, so 1010/104 = one million viruses will be produced each day with resistance to one drug. If we use two antiviral drugs, developing resistance to both occurs in every 104 x 104 = 108 viruses. In this case 1010/108 = 100 viruses will be produced each day with resistance to two drugs. If we use three antiviral drugs, developing resistance occurs in every 104 x 104 x 104= 1012 viruses, which is more than what is produced each day. This is why triple antiviral therapy has been so successful for the treatment of AIDS. And yes, I’m sure someone has tested Sofosbuvir for inhibition of Ebola virus replication. Would it be better to wait until multiple are available before releasing any of them? Thanks for posting this Vincent. About the math, just remember that Sofosbuvir is a nucleoside analog, so it binds to the same places in the polymerase as other NTPs. The main resistance mutation, NS5B S282T, comes at a very high fitness cost. This is one reason why Sofosbuvir is such a good drug…the other being that it is one the rare nukes that does not poison the mitochondrial RNAP. My friendly gut bacteria told me they don’t need any anti viral drugs to take care of phages as they can live with them. Your math by the way is ridiculous, you are assuming one mutation gives resistance to one drug and another mutually exclusive mutation is needed for resistance to another. However the probability of 3 mutually exclusive mutations (1 in 10^12) is totally independent of number of viruses produced each day (10^10), what happens is that these 3 mutations occur randomly and perhaps simultaneously in an unknown number of viruses (you should know better). Once a few viruses get immunity, they quickly multiply and make a mockery of your 3 drug therapy (which is what is happening to HIV+ve patients). However 3 drugs is three times the $ for your friends at the pharma company. The quack science you are peddling about is sure enough to fool the well bribed bureaucrats at the CDC. Yes, I did say the math applied to HIV-1. But you are correct on the Sofosbuvir cost, which would make it harder to get resistance to dual therapy than HIV-1. Do you know if triple therapy for HCV is being considered? I am sure that Gilead is working on it. I see we are now removing comments that question the scientific validity of articles. Do you agree that your logic used to derive the statement: “If we use three antiviral drugs, developing resistance occurs in every 10^4 x 10^4 x 10^4= 10^12 viruses, which is more than what is produced each day.” is incorrect as it assumes sequential single mutations, whereas in the wild you can have multiple random mutations. There is also the serious issue of disturbing the microbial ecosystem with 3 drugs. I am afraid this type of shoddy analysis is being used by the CDC and drug industry to peddle out expensive fake drugs. A quick note on comparing HIV drugs to HCV drugs – HIV drugs don’t cure the infection, and so given enough time the virus adapts to escape the drug (potentially at a significant cost, but still…). For HCV drugs, the drug combo only needs to successfully inhibit the virus for the duration of treatment, because then the virus is eliminated – so as long as the escape mutations are quite costly like Brett describes, the virus won’t outlast the treatment.